Ate soooo much in Poland - this is just from the first couple of days. 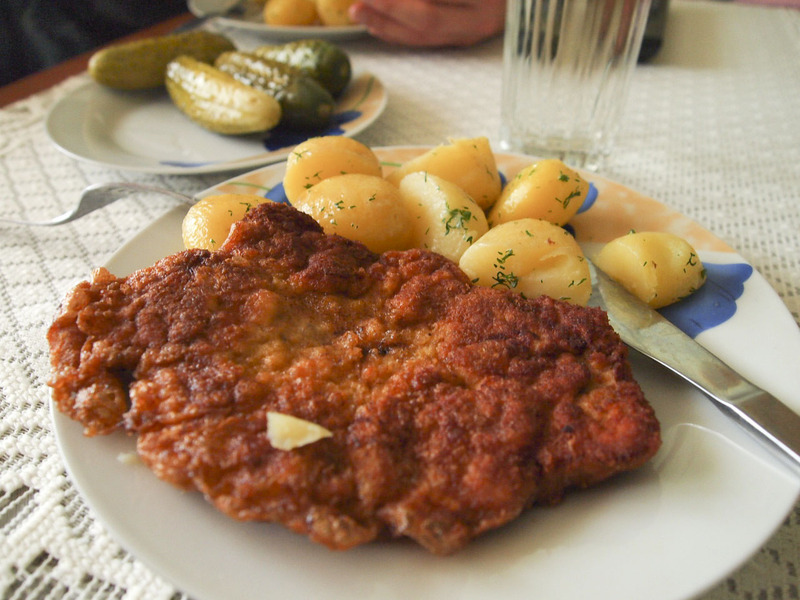 Manbacon's mother presented us with this wonderful meal as soon as we arrived home in Stalowa Wola - freshly made breaded pork and warm, buttered new potatoes with dill, as well as the obligatory plate of pickles. The perfect meal for two tired travelers on a rainy afternoon. I got hungry during a walk around the neighbourhood, so we headed in to Ekspres Bistro for a pick-me-up meal of pierogi, served with a garnish of crispy fried lard. Delicious homebaked goodies (again, made by Manbacon's mum) - raspberry cake with a jelly layer on top, as well as Polish-style apple cake-pie. Oh, and bread from a street stall in Krakow - it was so deliciously chewy I forgot to document it until very nearly the last bite. You'll see little old ladies selling these behind blue metal and glass carts all over Krakow. Did I mention I went to Krakow too? Well, I did.